To view a PDF of this story, click here. To see more photos from Acme Tools, click here. 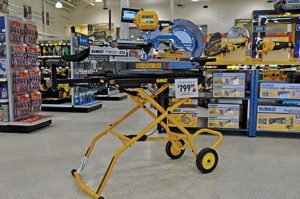 Did you ever think you’d sell a cordless table saw? What about a power drill with an app that helps you find it when it’s lost? Manufacturers continue to make bigger and better power tools, and now they’re going high tech. Recently, they’ve come up with a number of significant innovations, especially when it comes to cordless power tools. To get more detail on those innovations and how they will impact the future of the tool category, Hardware Retailing spoke with Clint DeBoer, editor-in-chief of Pro Tool Reviews, an online tool magazine. DeBoer has a job most any retailer or DIYer would envy. He and his staff get to test the latest tools— sometimes before they’re released to the public. 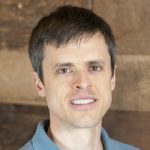 His website, www.protoolreviews.com, offers tool reviews and news helpful to any tool user or retailer. According to DeBoer, there are three major trends happening in power tools today: the emergence of smart technology for cordless tools, a greater variety than ever in cordless power tools and a revolution in battery technology. If you want to be the category leader in your market, these trends offer insights into the new products you should be incorporating into your assortments. In the photos throughout this article, we’ll give you a look inside Acme Tools (www.acmetools.com), a family-owned business based in Grand Forks, North Dakota that has 10 locations in North Dakota, Minnesota and Iowa. 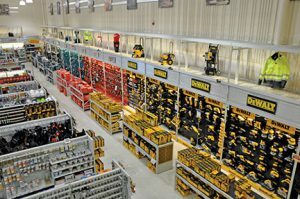 This 65-year-old company has established itself as a dominant competitor in the hand and power tool market, both online and in its retail stores. 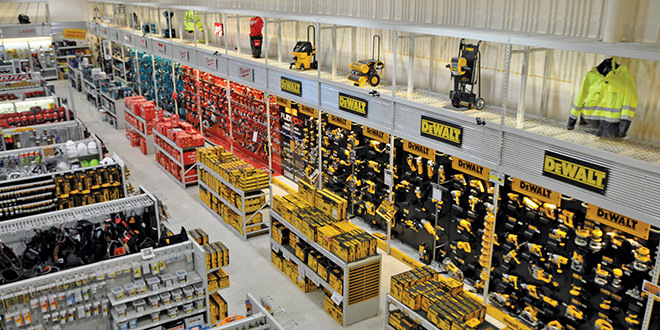 Scott Peterson, general manager of the Plymouth, Minnesota, Acme Tools store, calls his store a “house of brands.” Part of the store’s competitive strategy is to use a strong brand presence, coupled with a price match guarantee, to dominate the hand and power tool market. You knew there was an app for just about everything: now add power tools to the list. As smart technology makes its debut in the tool market, manufacturers are trying out different smart features to see what consumers will embrace. Apps that can control a power tool are possible today thanks to another recent development in tools: the brushless motor. In addition to the fact that brushless motors last longer and are more efficient for cordless tools, another big benefit is that this type of motor allows for more precise control of the motor’s speed and torque. “Brushless tools use a different motor technology than more traditional motors, which means they can be controlled by electronics in a way that wasn’t possible before,” says DeBoer. Since specific applications require specific speeds and torque values, the next logical step was to program those tools for those specific applications. When using an impact driver, for example, it’s easy to apply too much speed or too much torque to the fastener. The result could be driving the fastener too far into the material, or snapping off the head of the fastener. Some tools offer high, medium and low settings, or a dial with a range of speeds, but those seem primitive now compared to what smart tools can do. Smart tools take the guesswork out of those fastening applications. For example, you can set the tool with the exact speed and torque values you need for driving sheet metal screws, or drywall screws. In fact, you can even program them to start slow and then speed up, which is exactly what you might need to do when driving, for example, a self-tapping screw into sheet metal. The possibilities for how users can apply this level of control over their tools are endless, but the bottom line is that power tools can now be customized and configured for very specific applications. Where before tools came with a set of generic, pre-configured settings (or no settings at all), now individual users have the ability to customize the tool for any application. Those settings can all be created and controlled through a smartphone or tablet. Users can switch between modes for a tool simply by tapping on a screen. Currently, the pro customer is likely to be more excited about the ability to program settings on a tool than the average do-it-yourselfer. It’s important that you and your employees understand the technology enough to explain the benefits. Show your customers how using the correct setting on the tool for the application can save money on accessories. For example, someone using a reciprocating saw should know there are different blades for cutting through metal and cutting through wood. But they should also know it’s best to cut wood at a higher speed and metal at a slower speed. The metal-cutting blade will be more effective and last longer if it cuts at the proper speed. Cut at a higher speed and the blade burns out, fast. In the past, users could vary the speed of the saw by applying more or less pressure on the trigger. With a smart tool, those users can dial in a setting created specifically for cutting metal. Cuts made with the smart tool will be more efficient and more consistent, and blades will last longer. Smart functions also help contractors keep track of their tools. Some tool manufacturers are making that possible with RFID technology. Imagine a jobsite with multiple workers using tools out of a common tool crib. Whoever is managing that inventory of tools would like to know what tool is being used and who is using it. Workers on a jobsite can “check out” their tool for the day and managers can keep track of those tools via an app on a tablet or smartphone. It’s easier to account for all of the tools at the end of the day. Just swipe a scanner over the tools to check them in. The next logical step to this technology is theft prevention, such as the ability to lock down a tool when it’s stolen and then find it, but that feature is still in its infancy, says DeBoer. Current theft prevention features still have several limitations. If you have a tool stolen, you can report that tool as stolen and enter in the date and time when you last saw it. But the tool’s smart feature still relies on Bluetooth, which means the lost tool will only “appear” if the app is running on someone’s smartphone, and if that individual is within close proximity of the tool. Contractors who oversee a jobsite with a lot of tools in use should quickly see the benefits of a tool inventory management system. They can ditch the spreadsheets or manual checklists of what tools are in use. It will be easy to tell if all tools are returned to the tool crib at the end of the day so they’re not left unsecured. Some manufacturers also offer a function that allows the tool user to store all purchase and warranty information in the app. If a tool goes missing, or if there is a warranty issue, the tool owner doesn’t have to rummage through a file to find the correct paperwork. One of the best ways to start promoting these new items is to invite your key contractor customers for a tool demonstration day featuring, if possible, a representative from your key tool vendor. This type of event will show your customers you are staying current with the latest trends. Have the event during the slower winter months, when contractors are more likely to be able to spend some time at your store, and combine it with a customer appreciation dinner so you stay close to this customer base. The cordless jobsite is getting closer to reality. Power tools are once again evolving in a big way and more tools are going cordless than ever before. When cordless technology first appeared on the market, battery operation seemed a good fit for some tools, such as drills, that required low voltage. They likely weren’t suited for tasks that required long run times or that might put a lot of strain on the motor, or so went the general thinking. As technology improved, manufacturers continued to add batteries to more and more tools, but it wasn’t until the introduction of the lithium ion battery that the market exploded. Now, manufacturers and consumers are rethinking cordless. Lithium ion batteries pack a lot more power in a lot less space than their nickel cadmium cousins. That means manufacturers can put batteries on bigger tools that usually require high power and long run times, such as SDS max hammer drills, table saws and even grinders. There are more features and capabilities on these tools than ever before. Peterson puts new items front and center on the salesfloor, and then follows it up with advertising. Some of the latest trends in cordless and battery technology have been generating a lot of attention from his customers. Benchtop tools like the cordless table saw and miter saw will be ideal for customers working in remote areas without access to electricity. But for those with easy access to electricity, it’s yet to be seen if cordless models of these larger tools will win out when consumers must choose between that and a corded model. Regardless, if you want to make an impact with your tool department, it would be wise to bring in any new cordless tools your tool vendor offers, even if they are just for display. Do-it-yourselfers and contractors alike love tools, and they love looking at what’s new. 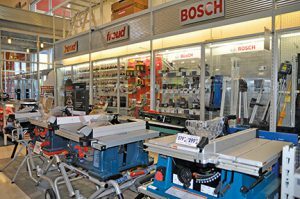 Even if these products aren’t fast movers, having the latest tools on display helps establish your dominance in the category so you become the place your customers come to make all tool purchases. Battery manufacturers continue to face the challenge of how to create a battery that lasts longer and produces more power. Turns out, a lot of it has to do with the battery’s wiring. Lithium ion battery technology has given manufacturers a whole new set of tricks to use. What does that mean? “Higher-capacity tools are also allowing us to get twice the run time from existing battery sizes,” DeBoer says. Batteries on the market today are more powerful than they have ever been in the past. That means they can power larger tools, such as the cordless table saw, and they will last longer, which makes them more practical. 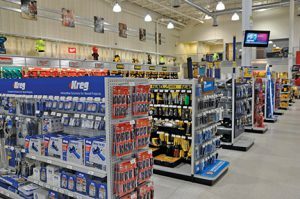 While major brand-name tools are merchandised along the wall at Acme Tools, adjacent aisles offer a complete line of accessories for each brand. In light of these recent trends, when selling cordless power tools, it’s important to clear up misconceptions customers may have about tools. First, voltage doesn’t tell the full story, and it’s easy to make the mistake of using that as the main basis for comparing cordless tools. Battery technology continues to be one of the points manufacturers use to differentiate their products, and recently there have been major advancements in this area. You’ll need to help customers distinguish between how different manufacturers are marketing their products. Some may emphasize higher voltage batteries, while others may emphasize run time. When selling, it’s important to dig down into the specs of each product so you get a true picture of how they compare. Another major consideration of a cordless tool purchase is the charger. Charging technology continues to improve. “As tools have gotten higher in capacity, the time required to charge a battery has gone up,” says DeBoer, “but there have been advancements in technology that allows charging to happen at a faster rate, too, so it evens out.” Most manufacturers sell a basic charger with the tool or tool kit. But most manufacturers also offer other options, so be sure to point these out to customers who may need faster charging times. Recommend rapid chargers, which will charge more quickly than the standard model, or dual chargers that will charge multiple batteries at once.